eat | 7- to 8-oz bottles, some solids. we’re working on getting you to eat solids more frequently, but you’ve been sick most of the last month! in fact, you’re sick again today and just want to sleep in your bed all day. :( but when you’re healthy, you love the usual: eggs, salami, ground beef, avocado/guacamole, blueberry & purple carrot teething biscuits, veggie straws, and green pea crisps. you’re finally close to learning the pincher grip, and are starting to pick up food with your hands. play | you love to play with your brother’s toys! he loves to take them away from you, but we’re working on that. :) it’s incredible — in the past month since you got glasses, you’ve started sitting up AND crawling! you’re scooting/army crawling everywhere. your favorite places in the house to go are the vent by the front door (it makes a scratchy sound you like), and the back sliding door to the backyard (you love to play in the curtains). you’ll play peekaboo and crawl around the couch with Jack. you also love to scoot all the way to the kitchen to find Mama’s feet. :) You’re quite curious these days. you also grew two teeth on the bottom! Owen, it’s incredible how much glasses have changed your life. I know you still can’t see perfectly (and never will), but magnifying things sure has been good for you! We’re so proud of you. Little Owie just got glasses! I was so worried he wasn’t going to keep them on (because the past four months have taught me he pulls off hats and sunglasses and it’s a losing battle) but the second we put them on he was fine. He really doesn’t touch them unless he’s tired or trying to rub his eyes. It is AWESOME and I feel so grateful that the transition was easy for our family. So let me back up a little bit here. Last year when Owen was diagnosed with albinism, we saw a pediatric ophthalmologist. And from day one, I did not like her. I didn’t like how she delivered the news, or how in our second follow-up appointment she still didn’t have answers or a plan for us. I just didn’t feel comfortable with her lack of involvement with Owen’s vision and nystagmus (where his eyes constantly move back and forth involuntarily). We decided to switch insurances and go see Dr. Granet, who is a leading pediatric ophthalmologist who specializes in nystagmus. He is wonderful and I left the appointment feeling so uplifted and in charge of Owen’s healthcare. I really feel comfortable with his diagnosis and feel like we have a “game plan” for the next year or so. Step one of that game plan was prescribing glasses! His previous eye doctor told us she couldn’t tell us what his vision was (she never even checked), but the first thing Dr. Granet did was check his prescription (+2.5 and +3, and it might go up). I have to admit, my jaw dropped a little when I heard he was getting glasses. I had considered it before, and told myself, “He’s going to need glasses”, but I didn’t think the time would be now! I just didn’t mentally prepare myself that for the rest of his life, he will wear glasses. It has really struck me the past few days that we have hit yet another turning point in Owen’s life — before glasses and after glasses. Before we knew he had albinism and after we knew he has albinism. Before he could see my face and after he could see my face. His life in my eyes is so segmented into periods of happiness and despair. Luckily I feel like glasses have come a long way in being accepted in our society (especially among kids) but it is still quite unique to ever see a baby wearing them. We get all sorts of comments in public. Most people just oooh and ahhhh about how cute he is. 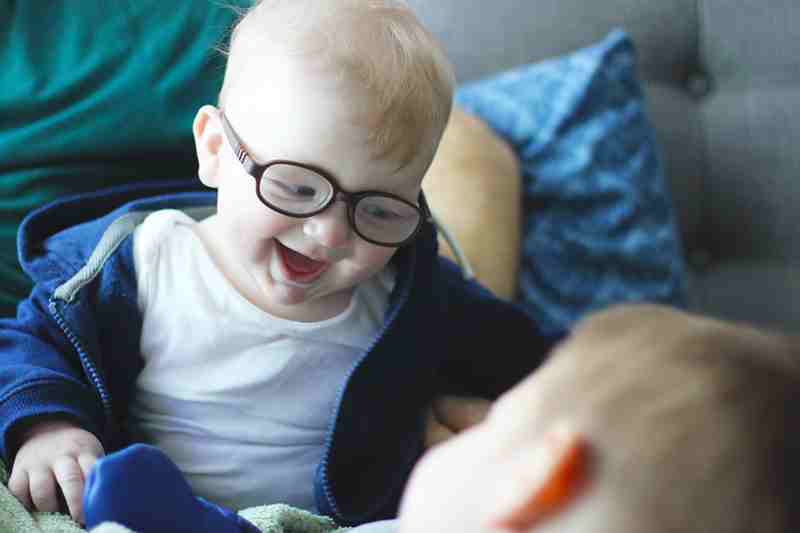 I think the attention is expected (honestly, I would probably do the same to someone else’s baby in glasses) but I do worry that they see his nystagmus and wonder about it. And I haven’t quite figured that one out yet. I am so afraid of hurtful comments when he gets older. However, favorite comments (meaning the funniest ones that we laugh about because we get them over and over again) include people telling me he looks like a hipster, as if I put glasses on him just as an accessory. ;) I am also told, “he looks so smart!” all the time. Yes, cashier at The Habit, my baby is automatically smarter than yours when he wears his glasses. *I think this means he is twice as farsighted as other babies his age. I expected him to be nearsighted? eat | I still don’t feed you solids on a routine yet. I’ll feed you bits of food here and there, and you seem to like it. You just don’t reach for them, but unless you just had a bottle, you rarely turn them down. You don’t like purees, except guacamole. Somehow you know that’s supposed to be eaten with a spoon. ;) Favorite foods include scrambled eggs, avocado, banana, chicken, sweet potato, and puffits. Oh, and you love cookies, too. :) Still drinking about five 7-oz bottles a day, though some days it’s less than that. sleep | still sleeping great at night (except the occasional 3am wake-up call…what are those all about?) but taking short naps during the day. I’m lucky to get an hour out of you for your morning nap, and 40-minutes for your afternoon nap. You do sleep in the ergo, though, if we’re out. You are so snuggly, little Owen. You love playing on your tummy, and inspecting toys very closely before putting them in your mouth. You’re really close to sitting up all by yourself but it doesn’t seem to be a skill that you’re itching to master anytime soon. So when I set you on the ground sitting up, you roll onto your tummy right away. I think you like to be closer to your toys. You really have come out of your shell lately, little Owen. You’re such a delight to be around, and even though it isn’t the easiest to make you smile, you are really very sweet and easy-going. You love to give kisses (big, open-mouth kisses on my cheek, where you grab my face and hair) and hugs. I think your favorite person is your brother Jack — you light up when you see his face. He makes you giggle the most out of any of us. Love you, little Owen. Keep growing big and strong, and the world is yours to conquer. eat | five 7-oz bottles a day (went from every 4 hours to every 3 hours again), plus any bits of table food I give him. this kid’s favorite food is eggs! he sits on my lap and I feed him my leftover breakfast a few times a week. the other night we were at Burger Lounge and I started feeding him some leftover ground beef from Jack’s hamburger. he loved it so much that TWICE he turned around and gave me the biggest, widest grin. (that’s really, really uncharacteristic of him – he’s not a big smiler, especially when unprovoked. I’m still in shock that it happened at all!) we’re working on helping him learn to sit up so that he can eat real food on a regular basis. he isn’t a fan of purees, but seems to do really well with regular food. sleep | it took a few nights but I weaned him off the binky a couple of weeks ago. he is sleeping through the night again, hooray! he doesn’t wake up screaming five or six times a night because his pacifier has fallen out. he isn’t a great napper — well, he isn’t a long napper, I should say. He will nap for about an hour, four times a day. but he’s easy, because I just lay him down in his crib and he falls right asleep. play | we are working on teaching him to sit up, but he doesn’t really express an interest in it yet. he loves his play gym, ceiling fans, being tossed in the air, snuggling, rattles, bright contrasty colors, his stuffed fox Freddy, and books. if it’s nap time and we are out, he will fall asleep on my chest in the ergo baby carrier. he is generally a really easy-going baby, and only really cries if he’s hungry or we are outside. he’s such a pleasant little guy and though it takes a lot of work to get him to smile, it brings a lot of joy when he does!